If you buy one children’s book this year….well first, buy more books. But especially buy Julian Is A Mermaid. I cannot fully express to you in words the beauty of this book. It’s a treasure. Julian is a young hispanic boy who sees some ‘Mermaids’ on the subway and is immediately enthralled. He tells his Abuela how much he loves mermaids. When they’re back home, his Abuela goes to take a bath, and Julian, Julian is inspired. He puts ferns and flowers in his hair creating a magnificent headdress. He adds some makeup to his face and uses a lace curtain to make a stunning ‘tail’. When Abuela sees, Julian isn’t sure what she’ll think. But Abuela is a treasure too and gives Julian a fabulous necklace and then leads him out of the house. Julian and Abuela for a walk and what do they find? A parade of Mermaids! Julian is Julian, he’s awed by the mermaids and with his grandmother’s encouragement, he joins them. By signing up, you’ll receive the latest book club features and relevant gift guides. We will never send you spam or sell your information. The story is beautiful enough, a tale of beautiful understated acceptance. But that’s not enough for author Jessica Love, because Love is also an amazingly talented illustrator. The illustrations are pure art in a way that isn’t always seen in a children’s book. I would literally hang the pages on my wall, they’re stunning. 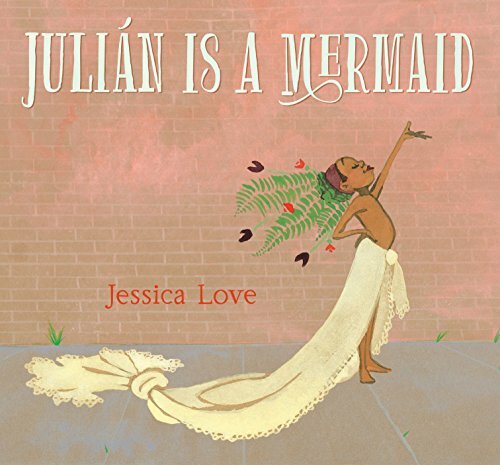 Julian is a Mermaid is light on text, it’s the kind of children’s book that you can talk about what is happening in the pages with the child. ‘Look at him swimming with the fish, look at those beautiful outfits, where do you think the people on the sidewalk are going’. RATING: Every child I know between the ages of 0-7 is being gifted this book, as well as several libraries. Buy one for you and one for a friend. Buy a third and donate it.